This entry was posted in Skiffy and tagged Fran Walsh, J.R.R. Tolkien, Peter Jackson, Philippa Boyens by Mike Glyer. Bookmark the permalink. A country that Andy Serkis may never visit. Yeah, I think Jackson, Walsh and Boyens are engaging in rules lawyering about whether the comparison is to Golem or Smeagol, but it’s for a good cause. If picking nits keeps this guy out of jail for breaking a stupid law that says you can’t make fun of a politician, I’m all for it. and forgot the tick thing again. The best you can say is that Jackson and Walsh are lying in a good cause. Because (and don’t tell the Turkish courts this), what they’re saying is complete nonsense, at least as far as what Tolkien wrote is concerned, and it was when Colbert said it too. Smeagol and Gollum aren’t a multiple-personalities case, Smeagol was not a sweet and lovable person before he grabbed the Ring, and the Ring didn’t acquire him in a hostile takeover; its lure simply enabled the growth of the seeds of evil that were already in his personality. I disagree. Smeagol was not, at heart, evil when he encountered the ring. He may have been a bit more selfish or ‘weak’ than others of his tribe, but all were tempted by and would eventually be corrupted by the Ring if exposed. Gandalf refused it, Galadriel refused it, etc for just that reason. I think it’s correct to say that Gollem was not the same personality as Smeagol. That’s a big reason Tolkien gave them different names, I believe. No. I didn’t say that pre-Ring Smeagol was evil – although, by some standards, he was. I said the seeds were there, and near to the surface. (See below.) While anyone who possessed the Ring would be corrupted by it eventually, Gandalf says clearly that Bilbo’s act of pity in acquiring it and his lack of a mercenary heart helped him to resist it far longer than otherwise. Bilbo held the Ring for 60 years and was still able, though reluctantly, to give it up voluntarily. Gollum had held it for only about seven years before he was kicked out by his people and went to hide in the Mountains. This wasn’t because the Ring treated them differently. It’s because of Gollum’s native greater susceptibility to the Ring’s lure. It is a fundamental misreading of Tolkien’s intent to say that they were different personalities. The names don’t denote a different kind of person: “Smeagol” already means “creeping, sneaking in.” Gollum was the development of Smeagol’s existing personality, and it’s essential to understanding the Ring’s meaning and Tolkien’s intent to grasp that. I still respectfully disagree. Although Smeagol’s weaknesses made him more suseptible to the Ring’s influence, the basic functioning of the Ring wouldn’t change, imo. It corrupts absolutely regardless of the person’s initial personality. It prevents a person’s better nature from overriding a person’s weaker nature, thus changing the person. It overcame Frodo in the end, and he wouldn’t have been the same person, again imo, had it’s destruction not released him from it’s influence. If you think they’re becoming a different person, you’re still misreading Tolkien, unless you’re watering down “different person” so far as to refer to any alteration in character, the way that the child is a different person than the adult. But you can still see the seeds of the adult in the child, and similarly you can see the seeds of a corrupted Ringbearer in the person they were before. That’s not what’s being referred to by those who claim that Gollum is a different persona than Smeagol. They’re talking about something like demonic possession. Their erroneous picture of Smeagol as a happy, friendly person requires him to undergo a complete 180 the instant he even sees the Ring, so that he abruptly murders Deagol to possess it. Maybe part of the problem is our differing definitions of “different persona”. My definition would be that if some outside power or individual takes away my will to the point that I can no longer know the difference or choose between “good” or “bad”, then I would consider that I was no longer myself, even if my initial personality allowed that outside power to get its hooks into me more easily than it could to other personalities. This would be even more true when understanding that this outside power overcomes everyone eventually, regardless of the strength of their initial personality and that person cannot get their will back until the Ring is destroyed. So, yeah, I think the Ring possesses the person. They are no longer the captain of their ship, they’re not the same person under the Ring’s influence. They’ve changed, yes, but what they’ve changed into is a different realization of themselves. The question that started this discussion was whether Smeagol and Gollum were different persons in the same body. The supposition was that they had nothing to do with each other, that Smeagol could be entirely good (by the same standards that Bilbo is good) while Gollum is entirely evil. This normalizes Ring-possession into something like demonic possession or multiple dissociative personalities. This is how Jackson reads it, but it creates for him the problem of why the Ring grabs some people, like Smeagol, instantly, and others, like Boromir, fairly quickly and insidiously, while it leaves yet others, like Faramir, alone, at least long enough for Faramir to abjure having anything to do with it. Locating the evil entirely in the Ring, and not in the resonance it finds in the bearer’s soul, he accuses Tolkien of inconsistency. But a better metaphor, suggested by Tolkien scholar Tom Shippey, is drug addition. A drug addict may be said to be “a different person” than they were before addiction, but only in a very limited, basically metaphorical, sense. An an addict’s personality is based directly on the weaknesses that they already had, and which in most cases led them to become an addict in the first place. This solves the inconsistency Jackson complains of. A person desiring the drug before using it, like Smeagol, will become immediately addicted on using it, or, like Boromir, will become enthralled to its craving even before using it. Any person using the drug will become addicted eventually, and thus any Ringbearer will be seduced by the Ring eventually, but the wise person will stifle the temptation even to try. Thus Faramir, Aragorn, Galadriel, Gandalf: the difference lies in their not being lured by the Ring, not in what would happen if they were lured. I’m not talking about what Jackson thinks, I’m talking about what I think. Smeagol and Gollum are different, but related, personas, imo. I read that from the way Gollum’s behavior and feelings change toward Frodo (Smeagol’s persona gaining some dominance) before he feels betrayed when Faramir takes him prisoner. I thought the schizophrenia scene in the movie was a brilliant interpretation of the hints of the inner conflict shown in the books. 1) Unlike the Ring, a drug doesn’t have a will and purpose of its own that actively and purposefully intends to subvert the victim. Sounds like a form of possesion to me. The Ring forces you against your will. I wouldn’t call the remnant of the personalities who are the Nazgul to be the same personalities that originally took up the subordinate rings given to human kings. An echo, maybe, with some tiny bits of will left, as long as that will coincides completely with Sauron’s. My definition is a bit looser and involves an outside entity subverting your will for it’s own purposes. Kinda like in the Jessica Jones program. Hope acted ‘normally’ and remembers every second of her actions up to and including the point she shoots her parents. Was it her persona that comitted that crime even though Kildrake had left the compulsion in her mind? Not possession, compulsion. I consider the Ring in the same class of nastiness as Kildrake, just somewhat more subtle. It’s not just semantics, because it brings up the question of how “persona A” (the pre-Ring one) is related to “persona B” (the corrupted Ringbearer). Too much emphasis on the difference erases the vital component of the seeds of persona B already contained in persona A, the result of which creates the error of mistaking Smeagol for a good person. The Ring is active, but it’s not active in trying to corrupt for corruption’s sake; it is, as Gandalf says, “trying to get back to its Master.” Too much emphasis on the Ring’s activity erases the vital component of the motivity of the person desiring the Ring, the result of which creates the error of thinking of the Ring as a demonic possessor. A demonic persona would be not the same person in any real sense: would be unable to realize his regret at having been caught or to dream of being a good person again. None of this is true of Gollum: he has a less corrupt side, a side that wants to be free of the Ring, and Frodo appeals to this side and is able to bring it out a little. Jackson stages this as a battle between two entirely separate personae, but that’s incorrect to Tolkien: his character is having an argument within himself. Shippey says that the Ring occupies a nice balancing point between a Boethian and Manichaean view of evil. It wasn’t until reading Jackson/Walsh’s and Colbert’s wacky views that I realized how great the error of treating the Ring as purely Manichaean was. I think the ring does much more than “reveal” character. In some cases there might be indeed an underlying weakness for the ring to exploit, but that character would also have had as well underlying strengths and virtues. The ring expands only the flaws. In this way it does not reveal some hidden truth, but rather recasts the whole in a new and dire way. That is, Smeagol had faults, but he was not deeply flawed before that fatal birthday. His path could have been quite different, had he instead fallen under some beneficial influence. Nor does the ring rely on only magnifying flaws, it can also pervert essentially positive qualities. Thus the ring exploits Boromir’s pride and protectiveness, qualities that before the ring were strengths and virtues. Both Galadriel and Gandalf point out that the ring would overcome them specifically through perverting their good qualities. That is, the ring is like a thumb on the scale, forcing a character down one specific path out of many. Or, perhaps, it is a funhouse mirror, not revealing a truth, but rather distorting and lying about what it finds. I guess we’ll have to agree to disagree. Admittedly, I haven’t read your Tolkien scholar, so I don’t have an informed opinion about his views. All I can comment on is my own interpretation of the story elements. By your interpretation, though, when Frodo stands on the lip of Mount Doom and the Ring finally overcomes his will (as the text basically says) and he declares himself the master, that was all in his persona already and had almost nothing to do with the Ring’s will/desire. It was all because he was addicted. Thank you for a very interesting discussion, but I don’t think either of us are going to change our opinions and I’m not interested in reading Tolkien scholarship so that we could have a more academic discussion. That’s a very good description of the Ring’s modus operandi. The main point of contention seems to be whether or not Smeagol and Gollum are different personas in one body or if it’s just one persona which the Ring has mostly corrupted who still has a couple of positive urges left. I hold that Smeagol has more nearly become a split personality (although not that clearly described in the text either way, therefore differing interpretations 😉 ). You also get the “possessed” vibe from Boromir’s actions before and after he tries to take the Ring from Frodo, imo. He was not acting in his normal character and would not have dreamed of doing anything so dishonorable in his ‘right mind’. I’d characterize the Ring’s action as a combination of possession and addiction/playing on weakness. The ultimate goal of the Ring, though, is complete subordination to Sauron’s will/benefit. Junego: I’m not trying to argue that the Ring is purely Boethian, either, though I can see how you might be reading me as if I am. It’s a pity that you aren’t interested enough in this to read Shippey’s The Road to Middle-earth, because from the level of care and detail in your comments I think you’d find it very interesting indeed. It’s the best single critical work on Tolkien. I’ve been thinking further about this, and I think the missing element from this discussion is volition. You mention the Nazgul: they have entirely lost human volition, and are complete slaves to Sauron’s will. They are also wraiths: they no longer have physical bodies, only their wills holding their shapes together. (And they no longer have their Rings, either: Sauron took them back.) Gollum is not like that: as Gandalf says, “he is thin and tough still.” No humans are in complete control of their volition: we’ve all eaten the chocolate, or smoked the cigarette, when we knew we shouldn’t. But generally we have a volition and can act on it. Gollum still has the volition of Smeagol: even the fact that he still responds to that name shows it. I wouldn’t mind your calling “Smeagol” and “Gollum” different personae or a set of split personalities if it didn’t create the false impression that the “Smeagol” persona had disappeared or was being forcibly held down by the Gollum one. But it does, and it leads too easily to the completely risible Jackson/Walsh/Colbert misreading of Smeagol. Laouwolf: Well, yes, but we’re actually saying the same thing. Boromir’s pride and protectiveness are certainly virtues to some extent, but – whatever you or I may think of them – to Tolkien they are inherently flawed. As dominant characteristics, they lack the humility which is what saves Faramir and Aragorn from Boromir’s fate. In Tolkien – though not in Jackson – Boromir raises quiet alarms from his first appearance: his eagerness to defend Gondor is justifiable, but too arrogant and too much for its own sake. Smeagol is a different case. While he might never have become totally depraved had he not encountered the Ring, he was not a good person even in the sense that Boromir was, and thus he was far more susceptible to the Ring’s charm. He didn’t instantly transform: that, and that alone, is the error I’ve been trying to correct here. All else has been side commentary. I think we are saying many of the same things, but that there is an essential underlying difference of opinion. We can take as both theologically-given, and also simple human experience, that all humans carry some flaws and weaknesses. And that the ring works to reinforce these, even when the fault is based on something originally positive: Boromir’s protectiveness, or Gandalf and Galadriel’s desire to do good. But where I differ is in the notion that Boromir, or Gollum were in some sense already and irretrievably inherently flawed. Even Gandalf is unwilling to touch the thing, remember. It doesn’t seem to me to require that the ring’s victims bring their fate upon themselves by somehow always already having deserved it. After all, the point of possessing volition, or free-will, is that even Smeagol, even Boromir, lacking the supreme temptation of the ring, could well have lived good and blameless lives. As a young man Smeagol was bad news, but it is possible, even common, for someone like that to chose to reform. The evil of the ring lies its power to overcome volition, its elimination of a person’s ability to grow and change. If Boromir could never have escaped the darker side of power and pride, then he really isn’t very interesting as a character, and his fall loses a lot of its impact. Boromir need not have followed his father’s path to misrule, pride, and madness. He could have overcome his limitations, and have grown in wisdom. Faramir loved and admired his brother, and Faramir was nobody’s fool. If Smeagol was always irretrievably a bad person, then the ring merely increased his ability to do wrong. Again, this simply isn’t much of a story: a bad person magically becomes worse. But if Smeagol had possessed within himself the possibility of being better, then the ring robbed him of something significant, and he becomes tragic. Lauowolf, your arguments are very intelligent but are so totally off in dealing with Tolkien’s world that this will take a great deal of unpacking. 2) “It doesn’t seem to me to require that the ring’s victims bring their fate upon themselves by somehow always already having deserved it.” I didn’t claim they deserved their fate, only that they left themselves open to that fate. There’s a difference. 3) “even Smeagol, even Boromir, lacking the supreme temptation of the ring, could well have lived good and blameless lives.” They could have, yes, though it depends on your definition of “good and blameless.” Smeagol might have reformed, even with his experience with the Ring (see #4 below), but a reformed life is not an unspotted one. Boromir was already impetuous and overly warhardy before he encountered the Ring: not necessarily fatal flaws, but in Tolkien’s eyes serious flaws. Part of Jackson’s problem as an interpreter of Tolkien is that he doesn’t realize these are flaws. He admires men like that: he thinks they’re the heroes, and he doesn’t really understand Aragorn, Frodo less, and Faramir least of all. 4) “Smeagol was bad news, but it is possible, even common, for someone like that to chose to reform.” He could have reformed even after his experience with the Ring, and he almost did. Did you notice that? It’s in Book 4, chapter 8. It’s interrupted by Sam, who misinterprets Gollum’s tenderness as an attack on Frodo. Tolkien several times in his letters pointed out the tragic irony of this, and that it was Sam, the most selfless character of all, who prevented Gollum’s repentance. So the Ring does not completely control, or wipe out, one’s volition, at least not at first, and Gollum, after being now long without it, was capable of being cured by Frodo’s care for him. 5) “The evil of the ring lies its power to overcome volition, its elimination of a person’s ability to grow and change.” Eventually, yes, once you become a wraith. But nobody besides the Nazgul has degressed that far. I think you’re changing the definition of “volition” on me. I define the lack of volition as becoming a zombie, going under demonic possession, with no ability to control your own actions. That’s how Colbert depicted Gollum, and that’s erroneous. When I brought up volition, I specified that having it – i.e. not being possessed or a zombie – does not mean you can always resist temptation. The Ring does not “eliminate a person’s ability to grow and change.” Bilbo does. Its evil lies in preying on your weaknesses. 6) “If Boromir could never have escaped the darker side of power and pride, then he really isn’t very interesting as a character.” First you said that it’s nobody’s fault if they can’t resist the Ring (#1-2), now you say they’re not interesting characters if they don’t resist it. What does “could never” mean in this situation? Boromir could easily have avoided the darker side, had he been a different kind of man: had he been his brother, for instance, who could have gone to Rivendell in his place, who almost did. He isn’t fated to do as he does: this is a Christian world, with free will. But he does as he does because he is who he is. Tolkien has a very complex relationship with the idea of fate. 7) “Boromir need not have followed his father’s path to misrule, pride, and madness.” And you know why and how this happened to Denethor? Because he was corrupted by desire for the Ring. You needn’t even touch it or see it to be tempted by it, if you are tempted. 8) “Faramir loved and admired his brother” He admired the good side of Boromir’s qualities. He did, however, recognize the flaws as well, and makes this clear in his conversation with Frodo. 9) “If Smeagol was always irretrievably a bad person …” Everything you write following this is based on the erroneous assumption in the word “irretrievably.” I never said he was irretrievably bad. Even in his degraded state in Book 4, he wasn’t irretrievably bad (see above). What I wrote, referring to his self at the time he found the Ring, was “he was not a good person.” That is not saying he could never have improved later. Rather, that is in opposition to Jackson and Walsh saying, of the same self at the same moment, “Smeagol is a joyful, sweet character. 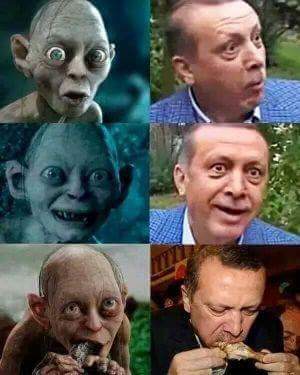 Smeagol does not lie, deceive, or attempt to manipulate others. He is not evil, conniving, or malicious.” That is complete nonsense, if applied to Tolkien’s character (and it doesn’t look very true of Jackson’s onscreen Smeagol, either). David Bratman: I’ve noticed over the course of this conversation that you seem to use words like “unspotted” to mean that the judgment of a person as “good” means “perfect”. I don’t think anybody else in the conversation is arguing that. Nobody is saying that Smeagol was a perfect saint, or could likely become one. They’re just saying that he had the capacity to be humanly good, especially in contrast to Gollum.